Binocular Comparisons: Which are Better? Binocular comparisons are a natural extension of binocular reviews. What are individual product reviews for if not for helping to get as high a performance to cost ratio as possible? Comparisons are a natural extension of that and, in our current global economy, aren't we each seeking to stretch our resources? "Your reviews seem better than most I've seen posted elsewhere. They're comprehensive, as well as pointing out the good and not-so-good in the same sentence. Reading the Yosemite review, for example, I felt like I was using it. Nice job." To that end, we published our first binocular comparison article. It attracted more readers than any of our individual articles, with most visitors going on to read other articles after seeing it. 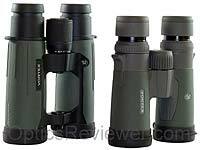 People have expressed much appreciation for each of our binocular comparison articles and expressed a desire for more. This page and the comparison articles it links to below are a response to that feedback and we hope it shows how much we value your feedback. We intentionally seek out what we believe to be above average binoculars for review. We count our readers as friends and we'd like to think that if you follow one of our recommendations, we'd be better friends after you used your new binocular. When we compare binoculars, we're comparing binoculars that are already good binoculars in their own right. The comparison articles take those good binoculars and help you to narrow you choices even further. Any good comparisons will tell you the fundamentals of how the comparisons were conducted. This allows you to assess their credibility and choose whether or not to put your faith and confidence in them. Areas of particular interest in a comparison article should include how well binoculars resolve details, how they perform in low light, how they deal with strong light (how much glare affects the view) and the field of view. Other possible areas of interest include close focus, color rendering, chromatic aberration and those things that a binocular user might be interested in if those items are significantly different between the binoculars being compared. If the binoculars being compared are sufficiently close in their qualities, it's reasonable to expect the reviews to include more information and focus on those areas that the reviewers found persuasive in arriving at a recommendation. Binocular comparisons at OpticsReviewer are provided for only two reasons: to maximize your enjoyment and help make the most of your resources. Since the Carson 3D ED and updated Monarch 5 with ED glass for its objective lenses are running so close in their pricing, we felt we simply had to compare them before we could possibly update our Best Binoculars listing. We were anxious to find out which one we would prefer between the two, because of the differences in their companies' histories. Which would we ultimately choose in this comparison? When Nikon updated the Monarch 5 with ED glass for the objective lenses, nearly everyone felt that a Monarch 5 vs 7 comparison article was in order. While we had our own ideas about what other changes, in addition to the new objective lens glass, had been made, we were all anxious to find out exactly what change Nikon had made in the updating process. One of them was a surprise to us and we're guessing it will be to you, too! (In order to differentiate between the "old Monarch 5" and the "newly updated Monarch 5," we've started calling the new one the "Monarch 5 ED." With the Nikon and Zeiss entries in the same price range, there's naturally interest in which might be a better buy for a person's particular activity. We performed the calculations necessary to demonstrate points for our readers and wrote up our thoughts on the significant items to consider for each binocular. We like the resulting article! When we first reviewed the Carson 3D ED, it carried a higher price tag and we compared it against other binoculars at its price point. Later, the Carson's price dropped enough to put it into another price category. The Zen-Ray ZRS HD came in as a strong contender at its price point, prompting us to review it. When we realized that they were being both offered at about the same price point, we concluded it was time to compare these two fine binoculars. We found the relatively little-known Sightron binoculars were interesting to test, but how would they stand in comparison to the well-known Monarch 3? Where would each of them excel? Find out what our testing revealed when we compared these two binoculars! 2011 Vortex Razor HD vs 2012 Razor HD Apochromatic Comparison When Vortex Optics introduced their apochromatic Razor HD binoculars, we quickly bought one in the 10X42 configuration and, after we had time to test it to our satisfaction and after we wrote an article about it, people wondered what the significant differences were between the older Razor HD and the new apo Razor HD binoculars. This is the resulting article! Of the Monarch 7 vs Elite ED vs Viper HD binoculars, which is the best buy? We wondered, too, and compared them against each other! Which do you think rose to the top of the group? We look at the Talon HD vs Viper HD vs Razor HD Vortex binoculars. What are their strengths and weaknesses? What's the Talon/Viper difference? Which maximizes the ratio of performance to cost?